Back in the early 1990s, if you needed a fast front-wheel-drive car to get to an MC Hammer concert, you would be best advised to avoid the popular choices like your buddy's Honda CRX, Integra GSR, or VW GTI -- and instead head to your parents garage and borrow the family Maxima. 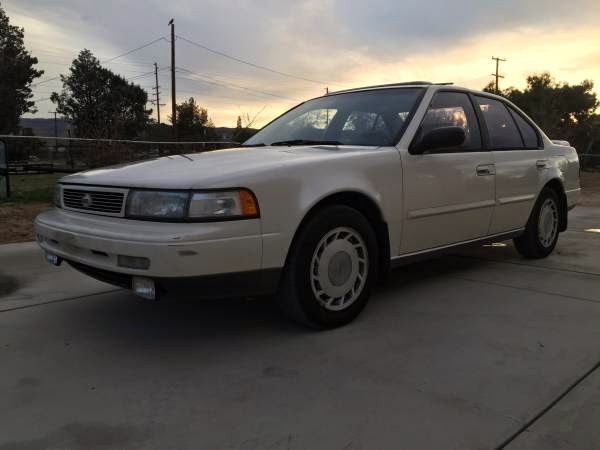 But it couldn't be just any Maxima, it had to be the 1992-1994 Maxima SE that used the 3rd generation chassis and the powerful VE30DE V6 mated to a 5-speed manual. 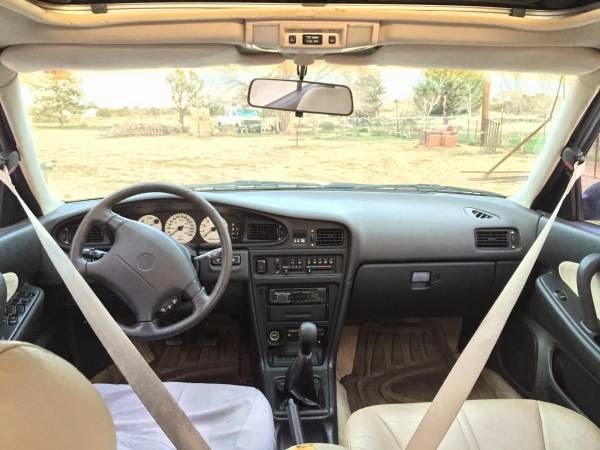 Find this 1992 Nissan Maxima SE offered for an undisclosed price, located in Lancaster, CA via craigslist. The J30 generation was only offered with the iron block VE30DE for 3 years and the engine was only available in the Maxima...but it made quite the Taurus SHO fighter out of the SE. 60mph was dispatched in 6.6 seconds and 1320 ft took 15.1 seconds, performance that, in the age of grunge music, was usually reserved for sports cars. It was faster to 60 than a 1990 300ZX non-turbo and you could fit 4 adults in comfort. It even came with a limited slip differential as a standard feature if you selected the 5-speed manual transmission. The VE30DE was a 24-valve DOHC V6 that featured an iron block topped with aluminum heads. The VE30DE also had variable valve timing, variable intake tuning (notably absent on the VQ30 engine that was used concurrently on the 300ZX and replaced the VE in the next generation), coil on plug ignition, and a timing chain. The iron block engine meant the following generation of Maxima actually shed a few lbs of mass when it was introduced, but for my money I'll take the chiseled good looks (and independent rear suspension) of the J30 over the Camry-esq A32 4th gen. It is just shame that finding a good J30 SE 5-speed is almost impossible. Wow, unicorn indeed. Since it is located in Antelope Valley, I would even propose that this car should be presented as a Jackalope. I did shop for a used 5-speed Maxima back about 10 years ago, but never came across the right combo. For this car, I might even put up with the mousy-belts. I had a 5 speed maxima but it was one of the blacked out 1987 versions. The V6 was powerful for the time and the build quality was great. I see this one has the same damn automatic seat belts. Mine also had a adjustable suspension knob near the e-brake. I was young at the time I owned it and ultimately ended up filling the car with an obnoxiously loud Orion stereo system. Nothing like a few hundred extra lbs of speakers to help performance. Stillen offered a supercharger for the above car that would make it a killer sleeper. I believe this generation was built to last. Ahhh yes....I remember a family friend had one of these and loved it. I still recall the "4DSC" (Four Door Sports Car) sticker on the rear side windows----that was a tagline Nissan came up with starting with this generation. As I recall, the big issue on these was with the variable timing control on these SE models with the 190hp engine-----they would get oil sludge in the unit and the cars would start making a nasty ticking noise. After two $1500 repairs (that was in mid-90's money) for this same issue, our friend dumped his, and I know that was the fate that many, many of these suffered back in the day. There are some fixes for that issue now that are a good bit cheaper (and have varying degrees of success in resolving the issue), but just be aware that while this engine was really ahead of it's time, it's nowhere near as reliable as the 160hp version found in the GXE model. These were nice cars, better materials and generally better design than anything that's come out of the Japanese makers since. 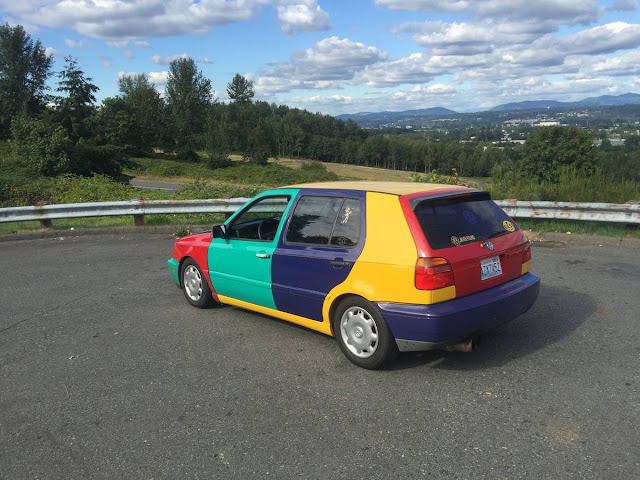 I thought about buying one, actually went to a Nissan dealer in BC to try to price out the parts to convert to conventional seatbelts (I would not then, and will not now, own a car with the motor belts). Unfortunately it doesn't much matter....over time, it happens to most all of them. Here's a link to what it sounds like--- https://www.youtube.com/watch?v=iE-40XYBVhw . The "grounding" fix is pretty klugey and doesn't last forever. If you're really comfortable under the hood of a car, it's a weekend project and $400-500 in parts. I'm with you on the overall quality of the car. It was the same with the early-mid 90's era Toyotas (especially the Camry). They built them to an engineering standard, and then the de-contenting really starting occurring in the late 90's. I think the Maxima generation that came after this one may have been the best built, but were nowhere near as entertaining to drive---they were Nissan's version of a Camry. This post makes me sad. Nissan is one of those companies that's produced some real shining stars, but seems unable or unwilling to capitalize on them. In my opinion, French ownership hasn't made the situation better (other than not going completely belly up). If anything, the quality of their products seems worse than ever. Nevertheless, as history has proven, they currently have a couple of very, very good cars...which they don't know what to do with next. Oy. 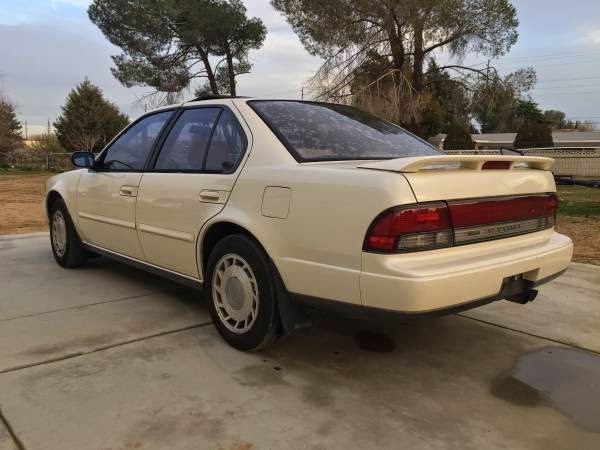 El Paso Honda has a 92 SE for sale. While certainly not thick on the ground, these do pop up on a fairly regular basis. Maxima.org is probably the best place to locate one through. I remember de-bosing many a 5 speed Maxima around 15 years ago working at Circuit City in Atlanta. I was shocked my how many of them came through the shop. As I recall, the majority of them had leather seats and sunroof as well. The first car I ever bought (used) was a 93 SE in that same Champaign color..ended up with an auto after I looked and looked for a manual. really good car, but it did have a few issues. the fuel injectors would go bad in these (had to replace a few over the years) and the window regulators were plastic, would get brittle and break and were a pain to replace. My brother outran the fuzz in one of these. Granted he had a huge headstart and hid in the woods for hours, but it happened! My friend Matt had a 1992 one of these in Louisville in 1994. Black on black, with Borbet deep dish wheels and Alpine stereo...the car was genuinely quick. Handled nicely too. He thought about trading up to a newer car, so we went to a VW dealership and drove a new Corrado VR6. That car sounded amazing and pulled hard, but in the end he kept the Maxima...and finally years later traded it in on a CPO BMW E36 M3 in purple. He said it was the only car that was better than the Maxima. He kept that for 15 years! These cars are rather difficult to find in good shape and low miles, and without rear fender rust. The engines are durable, and switching to a slightly thicker weight synthetic can quiet the noise for awhile and cleans out the sludge...the same trick works with Miatas with noisy lifters.